Tonight I have another mainly picture post as I finish packing for the flight home tomorrow. 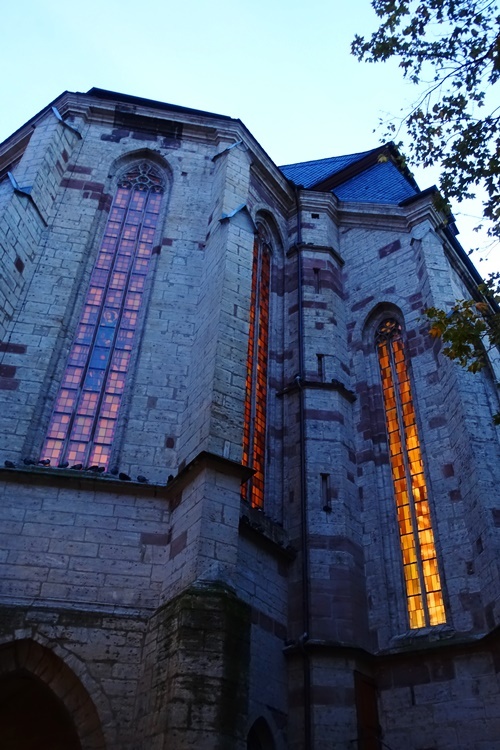 I will share some pictures that I took on a Sunday night after attending a worship service in the Stadtkirche St. Michael in Jena, Germany. I am not sure if I have taken pictures before of the church building with the lights on. Usually I walk by the building during the daytime or late at night when there are no services being held. 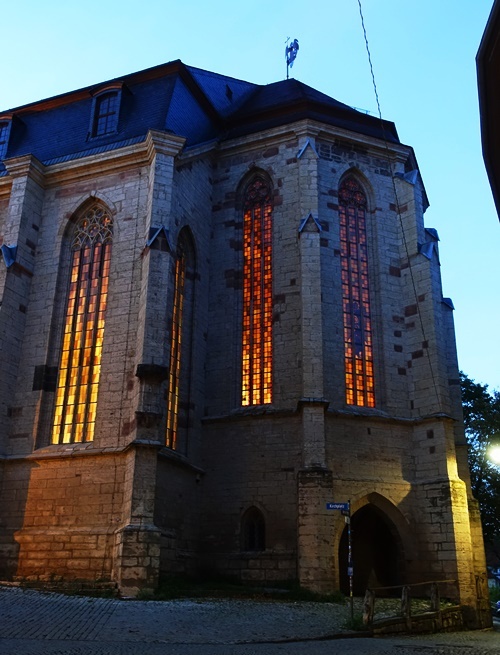 The stained glass windows look very nice when they are lit up from the inside. There is actually something unique about the structure of this building as there is a passageway beneath the altar of the church building. 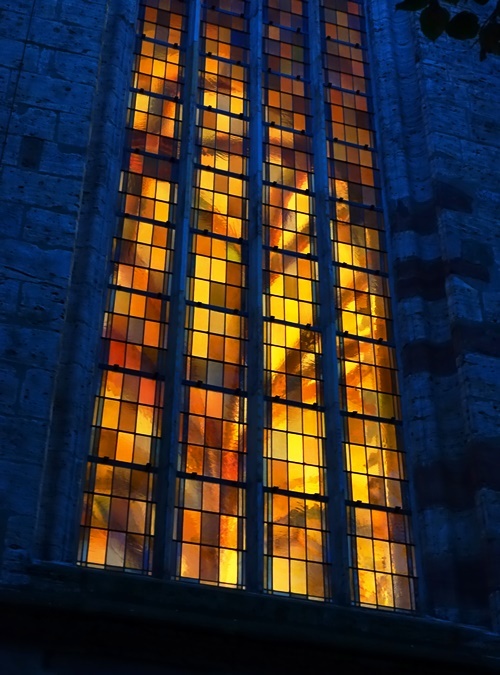 The windows are long and narrow and there is not room for large images, instead the windows are mainly just patterns of different colored panes of glass. Here is a closer look at the individual panes of glass. You can also see a bit of the internal architecture of the building in this picture, but it is very vague. I will share pictures of the inside someday in the future. 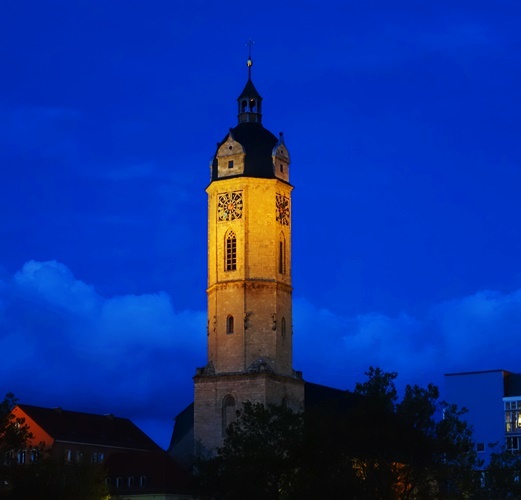 Here is a nice image of the church tower against the darkening sky. The building looks very impressive at night. The church building has several connections to Martin Luther, including the possession of Luther’s Original Grave Plate. 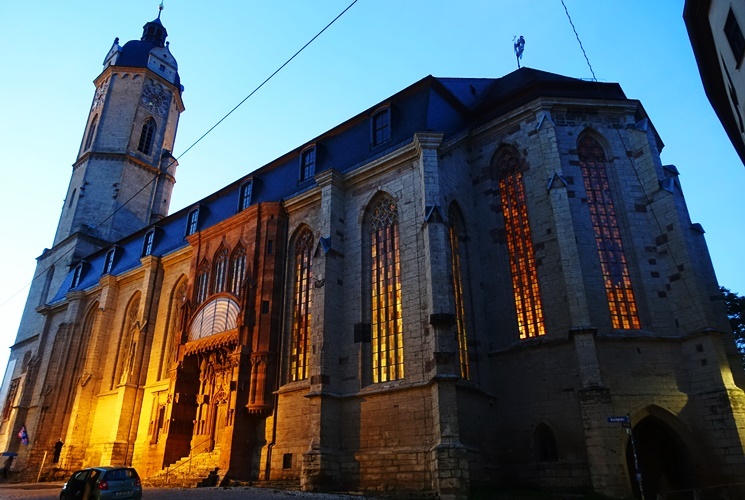 This entry was posted in Culture, Germany, History, Travel and tagged jena germany, Night, St. Michael's Church, stadtkirch, Stained Glass, windows. Bookmark the permalink.